You know the drill: It’s 6 a.m. Your day is jam-packed, and you need to get going ASAP. You’ve got a meeting. Work. Errands. Activities. And is it today you’re meeting up with a friend over coffee? As soon as you hop in the shower... Gah! Of course it had to be today that you’ve run out of razor blades. Prickly calves, once again. Shaving and waxing are a staple of life for many women. Often, we’ve grown up relying on one or the other (or both) to remove hair from our legs, underarms, and, you know... other places. But my gosh, that can be annoying. Laser hair removal, on the other hand, can be a new concept for some. As with any other unfamiliar concept, there’s some uncertainty. How often do you need a session? How does it work? And is it really so expensive?! 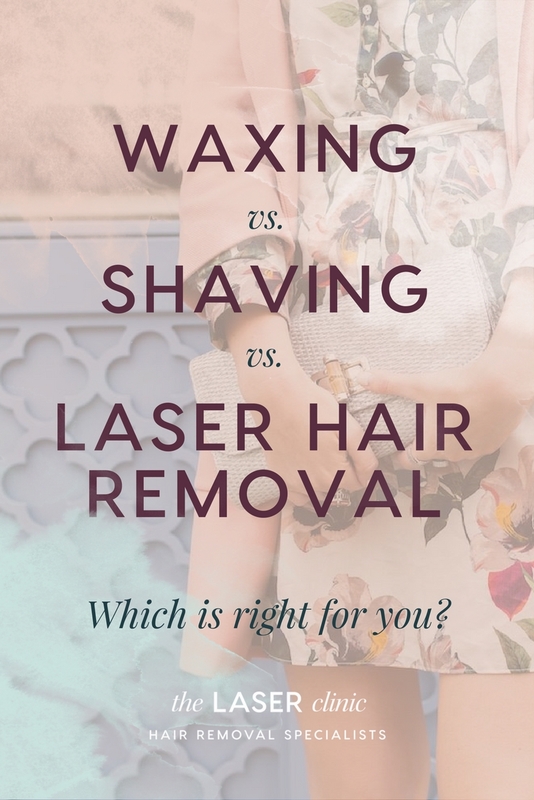 It’s true that laser hair removal might not be right for everyone. But we can clear up some questions to help you decide what’s going to be the best fit for you. What are the pros and cons of shaving, waxing, and laser hair removal? Let's go! Let’s start with the most familiar hair removal method: shaving. Prickle-haters, beware! Why does hair grow back so darn quickly? To maintain smooth skin, you’ll need to shave frequently. That could be once a day or once every few days—but you’ll have to keep up a regular schedule with quick turnarounds. Because you have to shave so often (and in perpetuity), a few dollars here and there may not seem like a lot at the time, but those costs add up. It’s important to use sharp and rust-free razor blades for safety reasons. Speaking of safety, can we talk about cuts? No matter how careful you are, mixing razor blades, hot water, steam, and slick shaving cream is really not a recipe for quick success. Some minor nicks and scrapes every now and then are virtually inevitable. Beyond cuts, shaving can irritate sensitive skin and cause razor bumps. And perhaps more painfully, some hairs can start growing into your skin instead of clearing the surface after shaving, resulting in ingrown hairs. Shaving pro: Do it yourself, at home! Shaving is often part of a regular routine for women: and you don’t need anyone else to get the job done for you. No appointments to schedule, and no transportation to juggle. Each time you shave, it’s a pretty small investment. A little shaving cream, a razor, and some water. No one ever likes buying a new pack of razors, but, hey, when you’re only spending a few dollars at a time, it doesn’t hurt your wallet at the time. In order to wax, your hair has to be long enough for the wax to get a good grip on each strand. So in between waxes, you’ll have a period of time with prickly skin which is definitely not ideal when you’re actually looking for smooth skin! Yep, you knew it was coming: the ouch factor. Waxing actually strips your entire hair away, and that can be a painful separation. Each waxing session certainly costs more than a quick shave in your shower (but less than a laser hair removal session). However, just like shaving, you’ll have to keep waxing as long as you want to remove your hair. Just like shaving, waxing can cause skin to be irritated and result in ingrown hairs. Waxing removes more of your hair—not just the part that’s already above the surface like shaving does. On a session-by-session basis, laser hair removal represents a significantly more expensive investment. While a pack of razors can set you back a couple dollars and a wax could set you back $30-50, one laser hair removal treatment can cost more like double or triple that amount. Since laser hair removal sessions can actually end when your treatment has run its course, your costs will cease as well. Unlike other hair removal methods, laser hair removal isn’t just a quick fix. It’s a long-term investment that you’ll appreciate every time you don’t have to stock up on expensive razor blades or schedule another painful waxing appointment. On the surface, it seems like waxing, shaving, and plucking is the cheaper option. However, in reality, if you were to add up all the money and time you spend buying razor blades, appointments, and tweezers - it would be a lot more expensive than the 6-8 laser treatments required. Unlike waxing, you can remove your hair in between laser sessions by shaving. That means you don’t have to put up with prickly legs! Say goodbye to those OMG, I’m out of razors again! mornings. With laser hair removal, you can get those mundane, repetitive tasks of shaving or waxing out of your schedule and list of worries - forever. There are few things as annoying as those little red bumps that shaving and waxing leave behind. They’re painful, irritating, and honestly - kind of embarrassing. With laser hair removal, you’ll never have to worry about those pesky bumps again. The treatments actually leave your skin smooth and refreshed. Laser hair removal pro: When you’re done, you’re done! After you’ve completed your sessions of laser hair removal (the total number can vary case-to-case but can often be between 6-8 sessions) your hair is gone—but not just the hair itself. Laser hair removal goes beyond simply removing a hair and actually targets the hair follicle itself. That means, unlike waxing and shaving, your laser hair removal sessions can actually come to an end. Breathe a sigh of relief! It all comes down to your situation—and, largely, whether you’re in a position to make an up-front investment that will pay off in the long run. We believe that laser hair removal can radically change lives for the better. But it might not be for everyone. The decision to switch from shaving and waxing to laser hair removal can be a daunting one. It’s a pretty big life change, so that’s why we think it’s necessary you know everything there is to know if you’re considering starting laser hair removal treatments. Our final suggestion: Get in contact with laser hair removal specialists to talk about your individual situation. If you're not sure, ask the experts!